Can a person develop a reprobate mind, and a mind that cannot be renewed again? If you have any knowledge about courts, you have probably heard about Probate Court. Probate means a court process by which a will is proved valid or invalid, but there could be any number of other legal issues involved too, but primarily a probate is to prove the authenticity, or not, of a will. It is a legal determination, so to have a “reprobate mind” means to have no authenticity or to be in an invalid relationship with God, and particularly with Jesus Christ. If a reprobate dies before trusting in Christ, that means they’ll be judged by Christ, but a person who trusts in Christ will no longer have a reprobate mind, therefore Christ will be their Lord and Savior, not their judge. He will judge believers, but according to their works done for Him (or not), but believer’s won’t be judged for their sins because they were judged in Christ at the cross. People who reject Jesus, even after hearing the gospel time after time, will develop a reprobate mind, because they’ve rejected the Light, and by rejecting the Light, they choose darkness. That person becomes a morally unprincipled person, and acts shamelessly, without blushing. We know what a reprobate is; a person that rejects the Light of Christ and chooses to follow the darkness, so that person falls under condemnation and disapproval by God. Sin has a way of callousing our hearts. I have callous’ on my hand. They’ve built up over time because I’ve exposed my hands to manual labor. The palms of my hands don’t feel the heavy lifting as much as they used to, so it doesn’t hurt anymore. Sin can do that. Once a person sins, and especially if they don’t confess it, the Holy Spirit convicts that person of their sin, but if a person continually rejects the prompting of the Spirit to stop sinning, after a while, you don’t hear His voice as much. Then you stop reading the Bible. Next you stop attending worship services. Before you know it, the person is sinning and has no conviction at all. The Spirit can’t get through and He’s been grieved so much by sin, and quenched so much by the flesh, that He is unable to communication to the person anymore. That’s when the danger of developing a reprobate mind comes in. When we are desensitized to sin by sinning over and over again, we start to lose that guilt over it. We can become “morally unprincipled” in other areas of our life. It’s like the frog in the pot. The heat’s slowly cooking him, and he doesn’t even notice it. That’s how sin is so deceptive. The sin-calloused person can reach a point where “the evildoers lie fallen; they are thrust down, unable to rise” (Psalm 36:12). The person who says they can’t possibly become a reprobate has already made their first mistake. Pride has set them up for a fall. A person who thinks they’re impervious to developing a reprobate mind has already slipped into phase one. The Apostle Paul would warn them, “Therefore let anyone who thinks that he stands take heed lest he fall” (1st Cor 1)12). Ancient Israel assumed that since they were the children of Abraham, they had a special place in the kingdom, but Paul reminds them about the ancient Israelites, “They were broken off because of their unbelief, but you stand fast through faith. So do not become proud, but fear” (Rom 11:20). Paul nails it! We can “become proud” so we should “fear” God. Besides, what do we really have to boast about (1st Cor 4:7) or how can we ever say, “We’ve got it made?” That’s when the Enemy has you right where he wants you and that is you are fine just the way you are, but there is a danger in having confidence in one’s own self. It’s good to have confidence, but our confidence is in God and not in ourselves since we can do nothing without Christ (John 15:5) and we can do anything only through Christ (Phil 4:13). The person that is worried about developing a reprobate mind is probably not at risk because they show enough reverence and fear before God than someone who has a reprobate mind wouldn’t even care about. However, the person who is sure they won’t ever develop a reprobate mind is the person that’s at the greatest risk. A person who fears having a reprobate mind is humble enough to show concern about it, while the second person thinks they’re above such a thing. That’s a slippery slope because we can so easily deceive ourselves into thinking, “I’m okay” but not realize the frog is slowly being cooked to death without realizing it. One way to prevent developing a reprobate mind is to be constantly in the Word of God because the Word of God cuts us to the core (Heb 4:12) and everything in our life is exposed before God (Heb 4:13), so let the Word of God afflict you (like it does me) in order that we might remain humble and pliable in the hands of God, the Master Potter. A clay vessel that thinks its okay becomes hardened and resists the Potter, but a vessel that humbly submits to correction will be useful for what God has in store for them. The Apostle Paul writes, “Therefore let anyone who thinks that he stands take heed lest he fall” (1st Cor 10:12), because a self-assurance is not really assurance at all, but when we read the Bible, the Bible examines us to show us where we fall short (and that’s in many places), “therefore take care that you are not carried away with the error of lawless people and lose your own stability” (2nd Pet 3:17). The question, “Can a person develop a reprobate mind, and a mind that cannot be renewed again?” has to be answered yes, a person can develop a reprobate mind and if a person rejects Christ so often and the light that is given by God’s Spirit, there is a point where God gives them up to a mind that cannot be renewed. People who reject belief in God do so of their own free will, even though they are without excuse since God’s existence is obvious (Rom 1:18-20), so “… even as they did not like to retain God in their knowledge, God gave them over to a reprobate mind, to do those things which are not convenient;” (Rom 1:28 KJV), and after a while, they can reach a point where “God sends them a strong delusion, so that they may believe what is false” (2nd Thess 2:11). 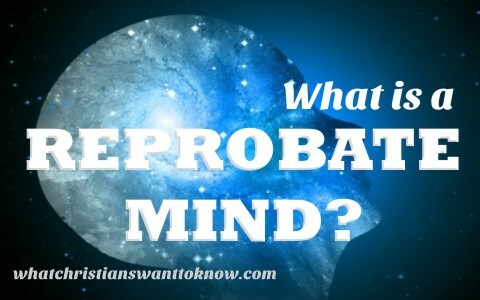 If you feel you have a reprobate mind, you probably don’t have one because no one who has a reprobate mind would even care about this, so if you are worried about it, you are showing you don’t have a reprobate mind. Take a look at this article on a similar topic: What is a Seared Conscience? I have to respectfully disagree, unless the person sincerely doesn’t want to be in a position to APPEAR reprobate. I know a so-called-Christian who never once admitted they were wrong about a bloody thing because they think Grace means they’re never wrong and don’t sin; even tho they do. Therefore, he never worries about being a reprobate because he is under Grace and therefore believes he can’t ever be reprobate. He sees his human flaws as sins; and he sees sins as something God cannot see because he is under the blood. He perceives human imperfections as to outward appearances, and deliberate sins as something that Grace cover. So basically, anyone can behave however they want and if anyone reacts to it THOSE are the ones who are sinning. So if pride becomes before a fall, it’s the individual who has near lost all desire to deliberately sin but say maybe has a temper against mean, nasty, narcissistic individuals? Next post: Whatever Happened To Nicodemus And Joseph Of Arimathea?